The Apple Device Enrolment Program (DEP) provides a fast, streamlined way to deploy organisation-owned iPads, iPhones and Macs purchased directly from Apple (or from participating Apple Authorised Resellers or carriers). DEP enables your customers to easily deploy and configure iOS and OS X devices so that their IT teams can focus on what’s most important — helping employees transform the way they work. Here are some of the benefits you can share when speaking to customers about DEP. How the Device Enrolment Program works? Signing up for the Device Enrolment Program (DEP) is recommended if your company is deploying company-owned devices. DEP automates MDM enrolment and supervision, making it easy for users to set up their devices right out of the box. 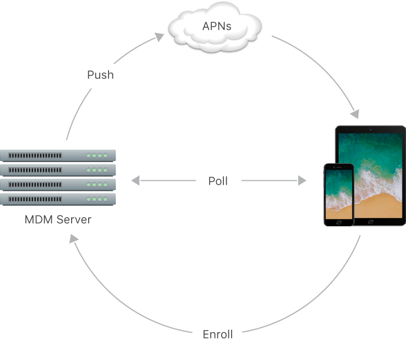 Your company’s Apple devices can be preconfigured to require automatic enrollment into MDM. This ensures that devices are configured to your company’s requirement and guarantees that all users get the configurations on their device. Your company can also lock devices in MDM for ongoing management. provides additional device configurations and features, such as web content filtering and single-app mode. With DEP, your company can wirelessly enable supervision mode on a device during setup. With DEP and MDM, initial deployments of iPad, iPhone, and Mac are seamless no matter how many devices are deployed. After users activate their devices, your employees can immediately configure account settings, apps and access to the organisation’s services over the air. There’s no need for staging services or physically accessing each device to complete setup. DEP makes it even easier for users to set up their own iOS devices and Mac computers. Using an MDM solution to configure devices, users are guided through the activation process with the built-in Setup Assistant. Your company can even streamline Setup Assistant by specifying that certain screens be skipped. The devices were ordered after March 1, 2011, and purchased directly from Apple using an enrolled and verified Apple customer number. The Apple customer number is the account number (or numbers) assigned to your customer by Apple, and is used to purchase Apple hardware or software. An account number is required to verify your organisation’s eligibility for the Apple programs. If your organisation has more than one number, all of the numbers will be added to the DEP account to ensure that devices purchased using any of the numbers can be included. If you dont know the number, contact the purchasing agent, finance department, or Apple account team. The Apple customer number is NOT the same as the GSX account number. The devices were purchased directly from a participating Apple Authorised Reseller or carrier and linked to that reseller’s DEP Reseller ID. A DEP Reseller ID is a unique identifier for each Apple Authorised Reseller or carrier who participates in the Device Enrollment Program. If you don’t know the DEP Reseller ID, they should contact us. The actual date of eligibility is determined by the sales history of your customer’s participating Apple Authorised Reseller or carrier, but the date can’t be earlier than March 1, 2011.